Up to 83% OFF. Deal ends 04/25/19 at 11:59PM. Photography is often very therapeutic, especially when developed as a hobby. A former Rider University student explores the psychological benefits of photography in this research paper. What Kind of Camera and Equipment Do I Need? This site outlines and compares the basic camera types available, from smartphone to point-and-shoot to DSLR. Both beginning photographers who have yet to buy a camera and professional photographers who like ease of access can benefit from a phone camera. This article explains the basics of smartphone camera function. This article, while tailored to iPhone users, also includes examples and general reminders for photography on any smartphone. This manual gives a very basic overview of digital photography, focusing on the physical aspects of digital cameras and what each setting does. This slideshow defines common photography terms, from aperture to shutter speed, and provides photo examples. For those in the market for a travel-oriented camera, this list from Consumer Reports offers compact, lightweight options. Traveling with an expensive camera and equipment is something to think about before leaving for your destination. These tips can help you decide what to bring and how. Street Photography Laws in the U.S. It's important to know your rights as a photographer in a large city in the United States so you don't infringe on copyright laws or accidentally break the law. This article covers the basics. Read about the specific regulations concerning photography in the NYC subway. 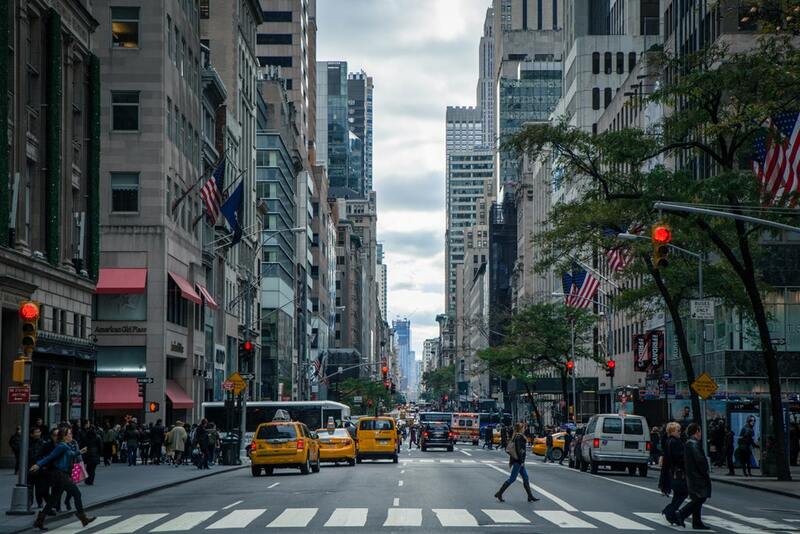 From Times Square to Central Park and beyond, the city is full of great places to snap photos. Brooklyn Bridge Park has a great vantage point of not only the Brooklyn Bridge but also the NYC skyline. Written by photographer Michael Brochstein, this article explains how and when to photograph several famous NYC locations, including the Brooklyn Bridge, Central Park, and others. Part of a series from the New York Institute of Photography on photographing people and places in New York City, this article features famous landmarks such as Times Square, Rockefeller Center, St. Patrick's Cathedral, and the Empire State Building. Take photos that are sure to make everyone jealous back home with some help from this guide! While not on the top of a typical tourist's list for obvious reasons (possible physical harm and potential trespassing charges), the photos of these locations are a good example of the contrast between the photographic theme of emerging nature and urban decay that exists throughout NYC. New York City has its fair share of beautiful churches, and many are open to the public. When visiting, it is important to show respect and get permission to take photographs. After gaining permission, take a look at these suggestions to improve photo quality in low-light settings. Iconic New York City landmarks are great to photograph, but these lesser-known ideas are sure to draw plenty of attention online. If you plan to attend any sporting events while in NYC, whether it be a Yankees game or the New York City Marathon, study these tips from sports photographer Rob Miracle. Kids can get involved in photography, too! If the family is in New York City, activities like a photo scavenger hunt can easily be completed on a phone or camera with a trusted adult. These photo challenges are also a good way for adults to practice beginning photography skills. Check out this slideshow on the best landscape photography settings to get professional-looking photos of the NYC skyline. Portrait photography skills are essential to capture memories with family and friends in New York City and beyond. Jürgen Lobert is a Massachusetts-based photographer with a Ph.D. in atmospheric chemistry. His article on the basic equipment and courtesies needed to take photos at night is a must-read for those intending to take nighttime pictures in New York City. Long-exposure photography captures the passage of time, usually through a change in the lighting of the setting. Cities like New York, with their near-constant flow of traffic, are great places to capture long-exposure images. Don't be afraid to take the same shots you see on postcards, but don't be afraid to go beyond that, either. For more suggestions on how to shoot effectively in soft dawn and evening light, read this article by photographer Lisa Holloway. Rain in NYC is not uncommon. National Geographic photographer Jim Richardson offers tips on what equipment and settings to use to get the perfect rainy-day shot. Likewise, depending on what month you visit New York, you may find the streets covered in snow. This article offers tricks to cut down on snow glare and balance brightness. In this article, Charlotte Lowrie teaches how to re-evaluate photos we've taken to find areas for improvement. NYC isn't just about famous buildings; it's also about the culture, the people within who make it such a vibrant city.